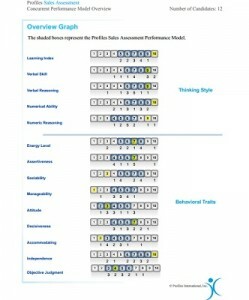 In our past articles, we reviewed the Thinking Style and Behavior Traits Sections of the Profiles PXT and PSA assessments. Based on a real world example of a 12 person team, we can see from their Profiles Sales Assessment Concurrent Performance Model Overview that differences in perspectives, comfort zones and cognitive abilities, can create real tension! By personally consulting with each team member to support the results of the assessment, we can diminish conflict within the team and increase productivity. The Third section of these assessments, Interests, is equally important to demonstrate how to mitigate tension and optimize execution in our team example. This section tells us the types of activities people are naturally attracted to perform. We measure 6 categories of key interests: Enterprising, Financial/Administrative, People Service, Technical, Mechanical and Creative. We report back in our assessment results on the top 3 areas of interests in order of priority for the individual or team. Occasionally, this section is underestimated relative to its importance. As we know, people generally perform activities at a high level that they enjoy. This section tells you definitively, what types of activities the individual or team really like to perform and where people prefer to spend their time. This section will provide valuable insight into how people will prioritize. Financial/Administrative: interest in administrative and financial tasks, office work and business procedures. People Service: interest in helping others, working with others, facilitating those in need. Technical: interest in Intellectual approaches, working with data, scientific study and research methods. Mechanical: interest in hands on tasks, being physical, working with things like tools, machines, equipment. Creative: interest in creative expression, innovation, using ones imagination and the aesthetics of things. As we review the Interests area in our team example let’s focus on the Enterprising Interests parameter. This team has an orientation towards enjoying sales and persuasion types of activities. As we look at the Team detail we can see a wide range of scores from 4 to 9. Seven of the team score 7 or higher indicating a real enjoyment for sales and persuasion types of activities. Six of the Team score 6 or lower indicating a meaningful difference in perspective, versus their colleagues, in enjoyment of sales and persuasion types of activities. In other words, 7 of the team members are really attracted to the Enterprising types of activities and will likely prioritize those endeavors. The rest of the team is likely to have other types of activities pull at their activity priority list. Certainly, you can see how this may create tension within this team. By having the Profiles PXT and PSA reports available for this team, this leader can optimize his team execution by creating tasks that fit their team member’s key interests thus mitigating tension and creating an optimal team environment. Check with us today to incorporate our Consulting Services and the use of the PXT Team and Executive Reports to operate more efficiently and effectively leading to Optimum Execution!